Vegan Coconut and Mango Chocolate Cups…an easy recipe made with clean, whole food ingredients and they’re “almost raw”, vegan, gluten-free, dairy-free, paleo-friendly and contain no refined sugar. 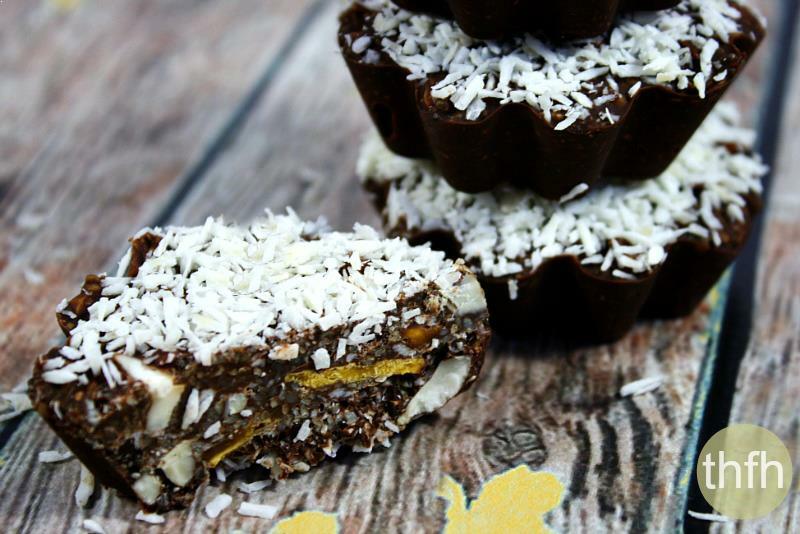 These Raw Vegan Coconut and Mango Chocolate Cups are loaded with clean, whole food ingredients like superfoods, nuts and seeds for a nutrient-dense snack that will keep you satisfied. They are more like “tropical” treat because of the coconut and mango, but they have a nice crunch to them from the hemp seeds, chia seeds and cashews. I used organic freeze-dried mangos and cut them up into little bite-sized pieces which gives it a natural sweetness. And, they can be prepared in less than 10 minutes and freeze well so they are perfect to pull one out when you need a quick burst of energy. It contains GMO’s (soybeans powder whole, maltodextrin), refined white sugar and salt, butter and eggs. This healthier version is made with organic, whole food ingredients and is “almost raw”, vegan, gluten-free, dairy-free, paleo-friendly and contains no refined sugar. Want more healthy dessert recipes? Check out Healthy Peanut Butter Cups, Clean Eating Peanut Butter Fudge, Pomegranate and Dried Blueberry Chocolate Bark or my Clean Eating eCookbook with an entire chapter of 20 healthy, clean eating dessert recipes just like the one that you will love! Tip #1: I made mine in these cute little silicone molds, but you could also use the standard size paper muffin cups ( <— try to get the unbleached, chlorine-free ones if you can). 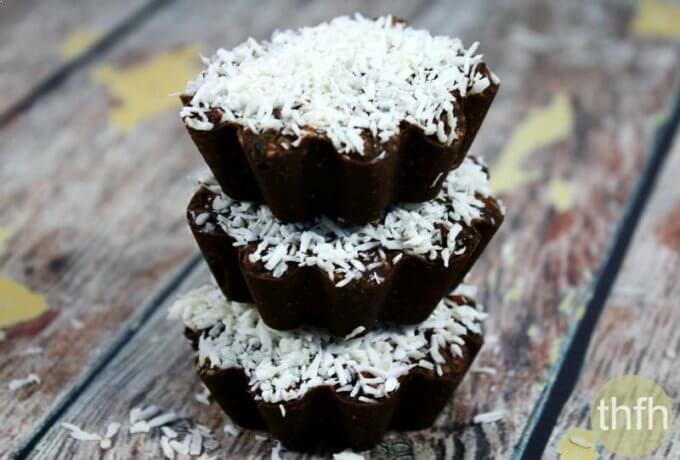 Tip #2: The extra coconut flakes on top are optional, and if you don’t like coconut flakes at all, you can still make these without the coconut flakes in the mixture or on top and they are still good. 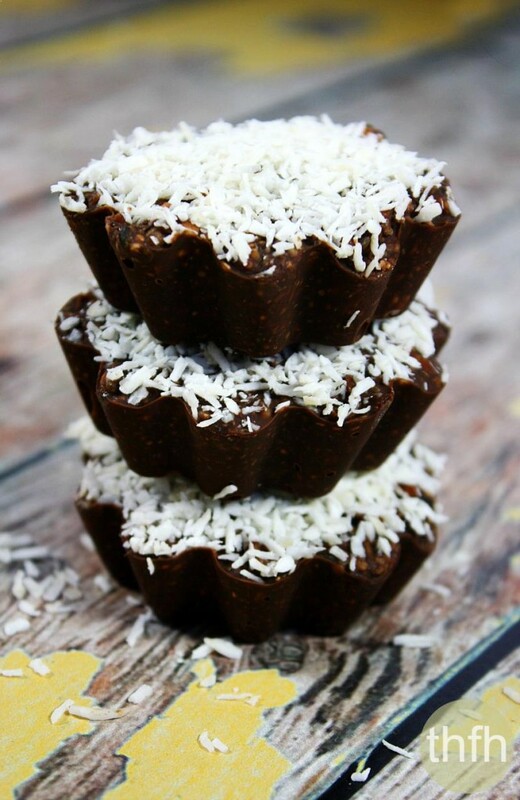 Tip #3: You can make these 100% raw by making your own homemade chocolate (equal parts of organic coconut oil, organic raw cacao and organic maple syrup). They might melt a little easier than using the mini chocolate chips and you will need to keep them in the freezer until ready to serve. Step 1 Prepare the cashews and dried mango: break/chop the cashews into small pieces and dice the dried mango into small pieces. Add the cashews and dried mango with all the other dry ingredients (coconut flakes, hemp seeds, chia seeds) to a medium sized bowl and stir so they are evenly distributed. Set aside. In a small saucepan, add the chocolate chips and coconut oil and melt on the lowest heat setting, stirring continuously making sure it doesn't burn and the mixture is smooth. Transfer the melted chocolate to the bowl with the dried ingredients and gently stir until everything is coated in chocolate and mixed well. Take 1 - 2 spoonfuls out at a time and fill your silicone molds or muffin cups. Optional: add extra shredded coconut flakes to the top for garnish and pat it down gently. Place them on a baking pan and put them in the freezer to 1 -2 hours, or until they harden. Store them in the refrigerator or freezer until ready to serve because they will get soft if left out at room temperature. This recipe will make approximately (12) standard size muffin cups. The recipe and photographs for " Vegan Coconut and Mango Chocolate Cups" by Karielyn Tillman of The Healthy Family and Home are licensed under a Creative Commons Attribution-NonCommercial 4.0 International License and cannot be used without my written permission.